Crystal Lizards are an Enemy in Dark Souls 3. 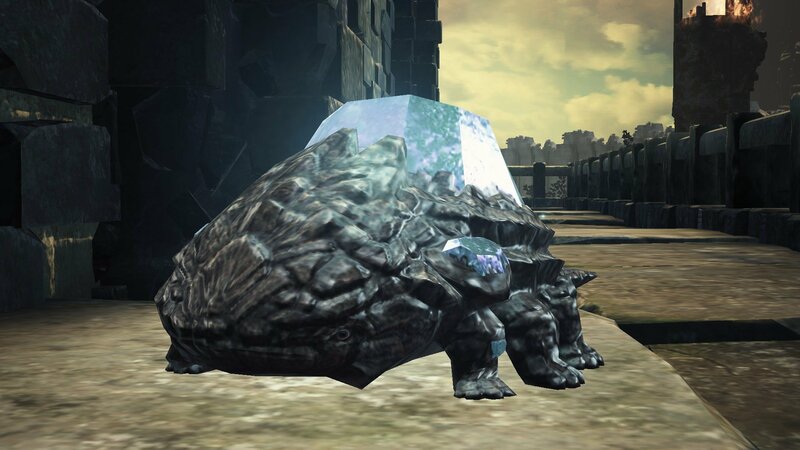 This curious beast will be seen scurrying across Lothric, its testudineous nature evident in the carapace ornate with a precious gem of sorts. In fact, upon death it will be possible to extract this ore, used as part of a rare weapon refinement and upgrade process. As a result, these lizards are avidly chased despite often appearing in hard-to-reach places. They will disappear if not killed quickly. Once killed, the items will be directly deposited into a player's inventory, which means the ore won't be lost on accidental death (like falls). Lastly, if one does get away, a reload will respawn it. These lizards must be killed quickly or they will disappear. It is not difficult to kill them, and as long as they are attacked they will not disappear. They are resistant to magic and immune to Poison, Toxic, Bleed and Frost. It is preferred to just attack them with a melee weapon. One easy way to kill them is to jump attack, they'll fall on their back and be flail around harmlessly for a couple of seconds. Once killed they do not respawn. Materials are dropped automatically into the player's inventory. Purchase the Tower Key from the Shrine Handmaid for 20,000 souls to unlock the Tower Door, then drop down from the first bridge onto the roof. Turn around and you can find the lizard on the ground behind the building. Alternatively, you can climb the roof via the tipped tree shown in this screenshot, then circle around the roof to reach the back. You will pass by the Sword Master along the way. At the bottom of the chasm before reaching Irina of Carim. Purchase the Grave Key from the Shrine Handmaid for 1,500 souls to unlock the door near the large Hound-Rat in the sewers. Follow the path until you exit into a muddy chasm. To your right is the lizard. Alternatively, you can also drop down from the short bridge where two Hollow Manservants will throw their bowls at you; though it's recommended to equip the Silvercat Ring to ensure survival of the fall. In a corridor past the Old King's Antechamber bonfire. From the Old King's Antechamber bonfire, enter the nearest hallway that's guarded by a Smouldering Ghru and take a right. Follow the corridor to find the lizard at the very end. The other method involves use of the Avelyn-like ballista. You can lead it to destroy a stone floor area near the center of the lake. Look for lit candles atop two pedestals to find the breakable floor. Once destroyed, drop inside to land in the same corridor mentioned earlier. The lizard will not be far. On a small terrace beyond the second Fire Witch. From the Central Irithyll bonfire, progress forward until you can see two Fire Witches: One walking with a group of Irithyllian Slaves and one on a high ledge. Take care getting through the plaza, but keep going straight. Once the pathway starts to bend to the right, look to the left for a small, lifted terrace. The crystal lizard will be waiting there. On the other hand, you can come from the Church of Yorshka bonfire. Make your way to the main road, turn right, and you'll be able to see the crystal lizard in the distance on the terrace. Be wary of the two Pontiff Knights walking down the road. Behind an illusory wall found right before the lake surrounding the city. From the Church of Yorshka bonfire, take the path down the stairs that leads to a cemetery. Lean left and continue down the flights of stairs to reach a darkened building. Mind the many Irithyllian Slaves lurking about, but go straight out the door on the other side of the building. Go down one more flight of stairs, and take the right before entering the lake. The crystal lizard will be hiding behind an illusory wall in the first alcove. Right after the Pontiff Sulyvahn boss arena in a small courtyard. Note: Must have beaten Pontiff Sulyvahn to reach this lizard. From the Pontiff Sulyvahn bonfire, exit the cathedral through the back, and make note of the two crystal lizards here in the courtyard. Same location as the lizard mentioned just earlier. On the upper levels of Pontiff Sulyvahn's cathedral. If you've unlocked the elevator to the second floor of Pontiff Sulyvahn's cathedral, then simply take the elevator up and make a right. Follow the path and the crystal lizard will be just around the corner. Otherwise, exit the cathedral through the back from Pontiff Sulyvahn's bonfire, and proceed onward until you reach a large courtyard full of Giant Slaves laying about. Head towards the left side of the courtyard to the arcade, and search for the door that leads to a staircase. Travel up the staircase, turn around, and head for the door that will take you back into the cathedral. Take an immediate left once inside, and follow the path to find the crystal lizard around the corner. In the second building on the same ledge a sleeping Giant Slave is resting on. Continuing from the first lizard of this region, proceed until you enter a large hallway with enemies pouring in from the other end. You have two options: You can fight through the enemies and locate the ladder on the opposite end, or you can drop through the first window directly to your right. In either case, the lizard will be right next to the Giant Slave's arm. Proceed with caution, as chasing after the lizard may wake up the giant. Projectiles are recommended for this. In an alleyway where Hollow Assassins will ambush the further you move into the alley. Note: If you kill this lizard, the other will despawn upon reloading the area. It is unconfirmed whether this is a bug or deliberate. From the Dragon Barracks bonfire, make your way up the stairs to where the Lothric Wyverns would blanket the bridge in fire. Instead of crossing the bridge, drop off on the right side of it. Be mindful of the two Pus of Man down here as you reach for the door out. The crystal lizard can be found in the alley just beyond that door; however, it's highly recommended to steer the lizard into the nearby wall to avoid triggering the ambushes down the alleyway. Past where you would attack the green Lothric Wyvern's foot to root out its Pus of Man. From the Dragon Barracks bonfire, progress forward until you're able to reach the first entrance past where the green Lothric Wyvern would blow fire. You'll be in a large, darkened room full of explosive barrels, which the Hollow Soldiers will use to their advantage with firebombs. Take care not to be within blast radius. The dragon's foot can be reached by climbing the ladder directly to the right upon entry. Instead of going for the foot, take the pathway to the left and go out the door. Follow the path to loop around the building, and you'll find the crystal lizard just beyond the small staircase. On top of bookshelves to the right of the kickable ladder past the dark room. Note: This is the only one that doesn't give a Twinkling Titanite. Upon exiting the darkened room, there is a kickable ladder directly in front of you. From here, look to your right and you can spot the crystal lizard waiting on top of some bookshelves. There are two ways to kill this lizard: You can angle yourself from the top of the kickable ladder, and snipe it with projectiles of your choosing, or carry on throughout the level until you reach the large bridge where the Crystal Sage spawns if you didn't kill it the first two encounters. A part of the bridge's baluster is broken, which will allow you to drop onto the same bookshelves as the lizard. On the sixth and highest floor in the archives just before reaching the roofs section of this area. From the first elevator shortcut for this area, travel up the stairs and go past the three Scholars to locate another set of stairs. The lizard will be located at the very top of this staircase. It's recommended to dunk your head in wax before engaging, simply due to the crystal lizard's tendency to run towards the cursed bookshelves. On the rooftops close to where the second Gargoyle appears. Upon entering the roofs section of this level, progress forward until you run into a Gargoyle standing out in the open on the rooftops. It will be the correct Gargoyle if you're able to spot Corvians on a lower level nearby. Both of the remaining crystal lizards are close by to the left when traveling up the roofing. Right next to the lizard mentioned above. On the way down to the Depths of the Painting bonfire. You must be on the side of the long bridge closest to Ariandel Chapel, and it must be broken to reach this lizard. If you've already opened the front door to Ariandel Chapel, you can come from its bonfire to descend the broken bridge. Otherwise, Rope Bridge Cave bonfire is just fine. Either way, swipe at the bridge to break it and descend. Tread carefully as you follow the roots down. You will find the lizard near two Farron Followers halfway down this path. You'll know you're close if you notice a Millwood Archer trying to shoot you off of the roots. On a lower ledge near the third safe zone that protects you from the Judicator's archer spirits. From the Mausoleum Lookout bonfire, make haste to the third safe zone. When facing the Judicator, peer over the edge to your right to find a lower ledge you can land on. Drop down and the lizard will be waiting next to the wall. ?? Near the skyway past a docile Locust Preacher after climbing a long ladder. From the Ringed City Streets bonfire, head out towards the swampy streets. Backtrack towards the large staircase where multiple Harald Legion Knights would spawn, but instead of going up the stairs, make your way to the right of it. Here you will find three Hollow Clerics, one of which will spin towards you in an attempt to ram you over. Climb the ladder near them, and look to your left as you walk up the stairs to find the lizard at the edge of the skybridge. Beware of the Ringed Knights on the opposite end of the bridge. It's recommended to equip the Silvercat Ring, and steer the lizard off the edge. It will sustain damage from the fall, and you can then finish it off with a plunging attack. ?? Near the Shared Grave bonfire inside the tower Darkeater Midir perches atop. You'll reach this tower after getting past the first encounter with Midir. Once inside, the crystal lizard can be spotted up the stairs. It's not recommended to travel up, as part of the staircase will cave in just before you can reach the lizard. Instead, head right down the stairs and search for the lower platform you can land on at the end of the path. Continue onward until you come across a series of hallways with reanimating Skeletons throughout. At the end of these hallways will be the crystal lizard. Alternatively, you can come from the Shared Grave bonfire and backtrack down the stairs. The lizard will attempt to escape by running over the same loose bit of flooring, which will still cave in if you step on it. However, you can jump the gap from this angle and still reach the lizard. Inside the building right after Midir's second encounter. From the Shared Grave bonfire, make your way across the long bridge where Midir would reappear a second time. Once inside the next building, look to your left to find a staircase. The lizard is halfway up this staircase. Anyone notice these guys can roll? One was right after the Crystal Sage fight and it literally tucked and rolled like a Roley-poley/pill bug down the path. It was the cutest thing! Fun fact: Crystal Lizards can actually deal damage to you if they fall on you. I was chasing one in Ariandel (the one in the room that leads outside to Pyromancer&apos;s Parting Flame), but it glitched out, ran up one of the left walls, and fell on me, stunning me for a second and dealing a small amount of damage. Shouldn&apos;t die if jumping down a cliff or not jumping down a cliff at all. If they run away from us they want to live. Jumping down a cliff goes against that. Reminds me each time that I play a game. When they lemming themselves for no reason and then the titanite is teleported into my pocket. Fun little trick: shooting a crystal lizard with a great arrow will cause it to flip over on its back side for a moment, making it easy to loose two shots in succession to quickly finish them off. Alternatively, Millwood Greatbow&apos;s skill will flip the crystal lizard over when the arrow connects, and if aimed properly, the great arrow&apos;s following explosion should finish them off, or flip them over again if they don&apos;t die. This method proves extremely useful for catching crystal lizards that like to run before you even get within range, or for ones that lead you to traps. I always use this method for the crystal lizard in Irithyll that leads you into an ambush by a Wretch, since it starts running before you even get within melee range. It should be mentioned that if a lizard escapes, you can just quit to the title screen, and the lizard will respawn, but not any of the enemies you&apos;ve killed. Saves the hassle of having to go back to a bonfire and fighting the enemies again on the way. This can also be used to manipulate which direction the lizard will go, depending on where you were before quitting. THEY ARE WEAK TO LIGHTNING!!!!!!!!!!!! Update this please. It also staggers them really well. This wiki page hadn&apos;t been updated in quite a while, so I took the liberty of reformatting the layout of the entire table to include more details on where these lizards were found in addition to what they dropped. I will be covering the DLC areas soon, as I need to re-confirm their drops, but if anyone already has information on exactly what each DLC lizard dropped, you&apos;re welcome to share. So at Lothric Castle past the Dragon Barracks there are actually 2 crystal lizards that appear. One on the set of stairs leading to the thief ambush area and the other appears on the ledge below the golden dragon that can be reached by going out the door opposite the entry way that is blocked by the golden dragon&apos;s foot in the darkened room. You can actually see both simultaneously by standing on the ledge before you drop down to get the life ring +2 in NG+.Now the odd part about these 2 lizards is they seem to share both the same loot and life. So if you kill one, the other will not respawn no matter how you reset the area. What&apos;s strange is all the guides I&apos;ve looked at only account for 1 lizard in the area, which is true in a sense, except you can clearly see both lizards in the respective spots at the same time. Now the only thing I have yet to try is killing them both by bow from the spot where each are readily visible. If anyone knows what&apos;s going on with these two feel free to fill me in or update the page with the correct info. Am i weird for thinking that these guys look adorable? resting at a bonfire does not appear to respawn them for me. I think an acutal game reset is required. If you go behind Firelink shrine (using the jump glitch to get the estas shard and silver serpent ring early) there is a small crystal lizard that drops a twinkling titanite! I went and summoned a sun bro, but noticed them both too late. They skittered off and dissapeared. But when I go back to my bonfire, they dont respawn. I found a stone crystal lizard in archdragon peak that only dropped souls. Is there anything special with it? I&apos;ve watched them disappear with no damage taken and not come back, is this new for this game? only got 1 hit on a lizard then it disapeared tried to reset with bonefire but it wont come back. are they gone from the game if they escape damaged? I started with depraved and the soul burial gift so I didn&apos;t have much to fight with. After leading it around the starting area for awhile I got to the cliff and tried to bait a roll. He never came far enough out of the cavern to get to the cliff, however, so I managed to kite around at the edge of his aggro range to bait out the belly flops. When he lands you can heavy attack the face and roll away again. He took way more damage from the club than I expected. Was lucky enough to get a sacred chime from the hollows first, so between using that and the starting estus flasks I kept my health topped up and had little worry. Killed it and thought I was doing pretty darn good until the ludex. Was it just me, or were the normal lizards extremely easy to kill? I don&apos;t think I ever missed a single one I went after, and they never seemed to lead into any traps or ambushes. I&apos;m happy to get the loot, and it was nice that they weren&apos;t lemmings like they were is Dark Souls 2, but I missed the challenge is all.